All right, I haven’t been cooking much lately. I’ve been eating delicious food, but not so much cooking. I just made a biiiig grocery list (with some fancy ingredients on it!) for tomorrow, though, so there will be some interesting things to read about starting tomorrow! One interesting thing about these cookies is that when I made them most recently, I decided I wanted slightly more interesting cookies and added the cinnamon. When I mentioned this to my mom, she told me the recipe as it was originally printed called for cinnamon, but she left it out (I have no idea why). I prefer to use the cinnamon, since it goes so obviously well with raisins. Raarr! I AM THE ALPHA COOKIE! Preheat oven to 375. Cream together the butter and sugar, then mix in egg and vanilla. Add the flour, salt and cinnamon and combine. Stir in raisins and mix in the oatmeal one cup at a time. Drop by large spoonfuls onto a cookie sheet (I line mine with parchment…until I finally get around to getting a silicone mat) and bake for 10-15 minutes. These cookies will stay soft for days if you keep them in an airtight container, and are wholesome enough to nibble on with breakfast. I’ve been thinking of trying different combinations of things to add to these, and maybe turning them into breakfast bars. 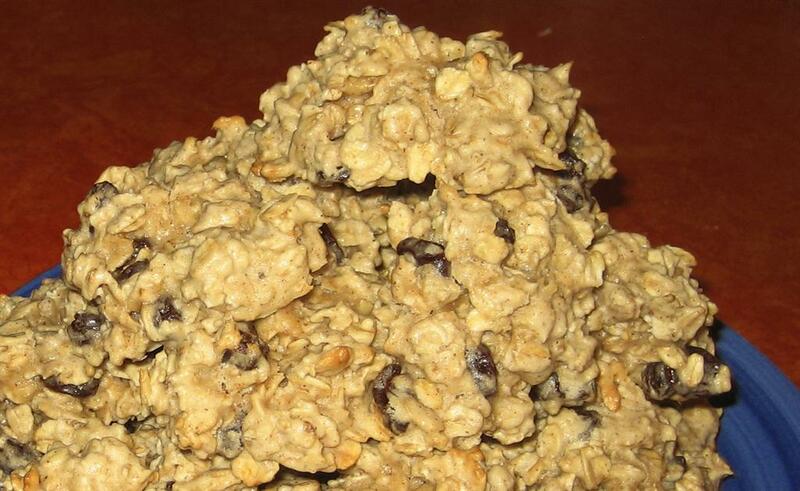 You can also use this basic recipe, minus the oatmeal, cinnamon and raisins, and plus chocolate chips and a little flour, to make very decent, fast chocolate chip cookies.